We don't often see much into the world of ultra-rugged smartphones and tablets as "normal" consumers, though we catch glimpses from time to time from the likes of CAT and such. These devices take many steps beyond the Galaxy S Active series in terms of durability. Since AT&T seems to be fond of these phones, it and Sonim have announced the XP8 for use on FirstNet. This phone looks like one solid piece of technology and, despite its middling specifications, it will cost a whopping $699. Obviously, the XP8 is not designed to be a top-tier flagship device; it's meant to be a durable, reliable phone for first responders and other public safety workers (though, how hard would it have been to include the almost seven month old Oreo?). It sports a puncture-resistant touchscreen (that works while wet and with gloves), IP68/69 and MIL-STD-810 ratings, peripheral attachments, a 100dB+ speaker, and a push-to-talk SOS mode. The XP8 can also access the special Band 14, a spectrum that was licensed by the AT&T-backed First Responder Network Authority. Sonim claims that the massive 4,900mAh battery will last for 35 hours of talk time or 600 hours of standby. The XP8 is one of the few phones that is more than its spec sheet, according to the marketing materials. $699, or $23.34 per month, is a bit steep, though I imagine there will probably be a bulk discount for some institutions. 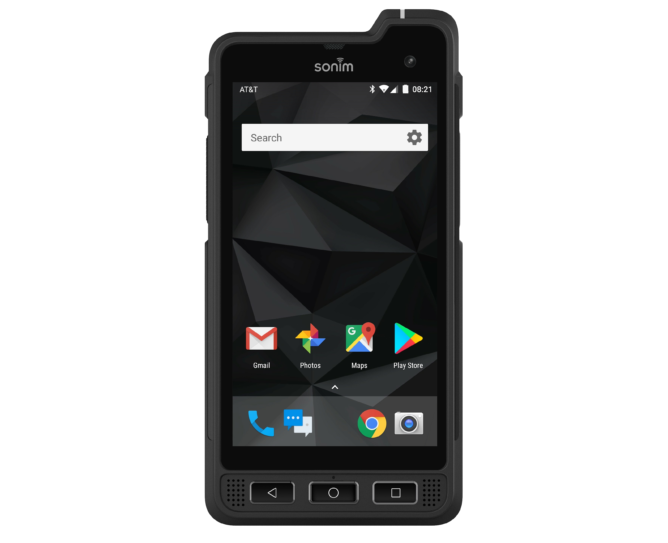 SAN MATEO, Calif.--(BUSINESS WIRE)--Sonim Technologies, maker of the world’s toughest cell phones, is bringing two new ultra-rugged mobile devices – the XP8 and XP5s – to first responders on FirstNet, the country’s first and only communications platform dedicated to public safety. Together, FirstNet and Sonim are unlocking innovative, specialized tools that will help advance first responders’ communications capabilities, allowing them to focus on keeping both themselves and our communities safer. The XP8 and XP5s demonstrate Sonim’s expanding leadership in the ultra-rugged mobility category and its unwavering commitment to the public safety market, delivering industrial- and military-grade devices built to work in extreme conditions and environments, while integrating functionality critical for first responders. Both devices come with an industry-leading comprehensive three-year warranty, and include the SCOUT Enterprise Xperience, allowing businesses to more efficiently manage and control communications. They also include Sonim’s SecureAudio Connector, allowing workers to securely attach mission-critical audio accessories that are powered by the handset. FirstNet, built with AT&T*, is the first communications platform to announce support for both devices, which will be available to FirstNet users later this month. Once available, first responder subscribers can use the XP8 or XP5s to unleash the full power of FirstNet, accessing critical capabilities like First Priority™. This includes both priority and preemption, giving first responders a reliable, highly secure and always-on connection to the information they need. Plus, both the XP8 and XP5s are integrated with the AT&T Enhanced Push-to-Talk (EPTT) platform for FirstNet. The XP8 and XP5s also come with built-in Band 14 access. Band 14 is special spectrum licensed by the First Responder Network Authority that will be used to further build out FirstNet. This gives first responders access to even more coverage and capacity on the FirstNet platform. These ultra-rugged phones will also support customers on AT&T’s network working in industries where reliability and durability are crucial – like construction, manufacturing and transportation. The XP8 is a new ultra-rugged Android smartphone that’s designed to empower public safety workers to focus on what they do best—protect and serve our communities. Extremely Loud & Clear Audio with a 100dB+ speaker and noise cancellation, supporting traditional voice calls, as well as AT&T Enhanced Push-To-Talk (EPTT) talk-groups. Sonim’s XPand Interface, which extends the capabilities of the handset through rugged attached peripherals, such as Direct Mode Modules. A Handset Powered Audio Interface with locking mechanisms, which securely attaches mission-critical audio accessories that are powered by the handset. Gloved hand/Wet finger operation for applications, such as initiating the camera or video. The XP8 also includes a large, dedicated button for EPTT. A dedicated SOS red alert button for ‘lone worker down’ solutions, allowing public safety workers to initiate an emergency voice call to responders when needed. The XP8 also includes intelligent accelerometer monitors to detect potentially hazardous events or situations.